The shop and kitchen sets were built inside the vast open space of the former banking hall. They were often visited by Nigel Slater to check on progress. They also used the Black Country Museum as 1960s Wolverhampton. Sarah visits the temporary headquarters of a local gang leader to get some heavy lifting equipment to help free Anya and Al from the collapsed hospital. She visits the bank vaults and then is submitted to a violent assault in the offices on the first floor before she gets what she needs to help free her friends. Sean visits the National Bank of Syria to gain access to a safety deposit box that will allow the gang to complete their daring robbery. Bank appears at 02m22s into the clip. Cool Hand Cooper gets delivered to Eddie’s Bar in a crate and recounts the tale of a daring diamond robbery (06m44s into the clip) which takes place in the same bank vault as the final episode of series 6. 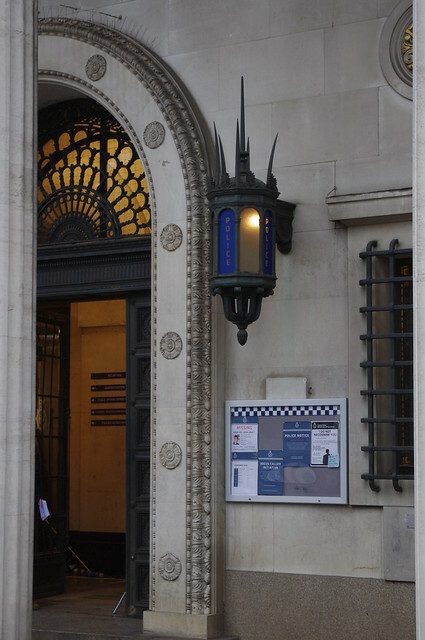 The new five part BBC2 series used the Broad Street location as a production office base and the Bank itself was transformed into a police station set for the series. After a few days the police signs (the transformed ornate lights) were covered in black bin liners when not being filmed, as a result of what I can only assume was trouble with passers by looking for a policeman. The crew also filmed a daring stunt on a section of the Birmingham city centre canal network. Near to the site of the former science museum and stunt man leaps from the 5th floor of an apartment block into a carefully constructed landing area of cardboard boxes. The Queen’s Arms public house on Newhall Street was also used a number of times to film scenes for the series. BBC announced that Line of Duty will air on BBC Two from 26th June 2012 and you can watch the trailer and read the series overview on the BBC Media Centre. 1968 British satirical comedy film directed by Peter Hall, adapted from Henry Livings’ play “Eh?” and starred David Warner and Cilla Black. It was not well received by critics and is notable for being Black’s only starring role in film. Filming took place in 1967 in and around Five Ways and on William Street.